Spring school holidays means more precious time with my little man and of course, more time in the kitchen! To celebrate, we went ice skating on Monday. What a hoot! I haven’t been on skates in about 20 years but it was like riding a bicycle – I think your body just remembers what it needs to do. I did have one big fall though, and felt more silly than anything else, but we definitely seem to fall harder the older we get. Our bones don’t bounce the way they used to. Afterwards, we had fun making these very sticky treats. The recipe says to roll the mixture into balls, but my mixture was having none of that. So I eventually used two spoons and improvised. The recipe also calls for rolling the balls in the coconut afterwards, but although I like dessicated coconut, I’m not crazy about it, so I opted for less and just threw it in with the rest of the ingredients. They have lovely dried fruit in them. I always enjoy this type of recipe as it is really versatile and you get to use whatever dried fruit you have on hand – raisins, cranberries, sultanas, apricots, pears, apples, dates or even chopped nuts if you’re keen. I used chopped apricots and raisins. And don’t worry about only using half a tin of condensed milk – either double the recipe or use the rest to make my favourite Chocolate Chip Cookies!! 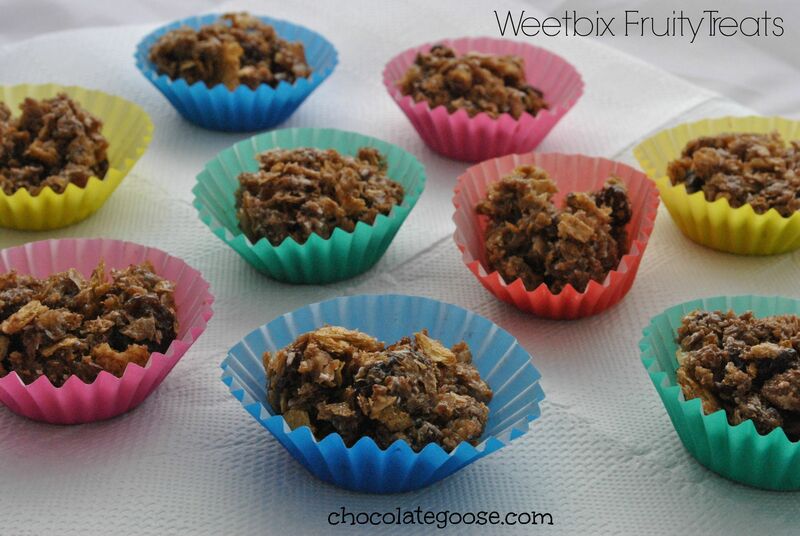 In a large bowl, combine the Weet-Bix, dried fruit of your choice and cocoa. Blend in the sweetened condensed milk, mixing well. Roll tablespoonfuls of the mixture into balls. Roll in the coconut and place onto a plate or as I did, into mini cupcake cases. Store chilled in an airtight container for a few days. Great for lunch boxes, afternoon tea, a holiday picnic snack or even for treats at a school/church fete or gala.